The best and goof-proof way to wear madras is to wear one instance of it, with everything else toned down and grounded in basic styles and neutral colors. 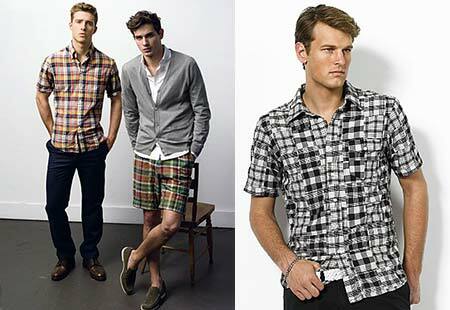 The most low-key madras garments to wear are short-sleeved shirts and shorts because, well... there's just less fabric to wear than long sleeves, pants, or jackets. Also, if you're not fond of the preppy look and afraid the madras will instantly transform you to Mr. Nantucket, this formula is your insurance. The key to current madras dressing is to look for garments that are slim fit, with subdued, sun-baked vegetable colors that aren't too flashy. Pair a subtle madras pattern with crisp dark pants or jeans, and finish with dark shoes – this will provide the gravitas that counterbalances the casualness of the shirt. Tuck in the shirt and add a dark blazer for the evening, and you'll be the handsomest man in at least a 10-block radius. To dress up shorts a touch, wear a white button-down shirt with a lightweight solid neutral cardigan, paired with white-soled luxe suede slip-ons. A cardigan feels more contemporary than a classic pullover, and it's easy to slip on and off depending on the temperature and time of day without messing up your 'do – just don't tie it around your shoulders if you don't want the prep association. For an even more modern look, opt for a slim fitting black-and-white graphic patchwork (above). All the components still reference the madras, but without the telltale colors. Besides the stylish trim fit and minimalist color combo, the shirt has another element of newness – the button-flap chest pocket. And if you really can't get yourself to get inside a madras (or madras-like) shirt or short, ease into it with accessories or shoes. Everything comes in madras – as ties, belts, and even watch straps. 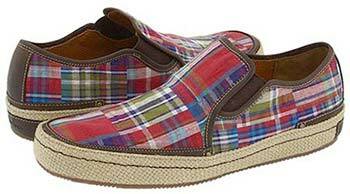 Here's a pair of canvas shoes that you can casually slip on for a taste of this centuries-old summer fabric. Wear it for fun with a pair of jeans (or shorts) and t-shirt to energize a lazy summer afternoon.